For the purpose of monitoring the behavior of complex infrastructures (e. g. aircrafts, transport or energy networks), high-rate sensors are deployed to capture multivariate data, generally unlabeled, in quasi continuous-time to detect quickly the occurrence of anomalies that may jeopardize the smooth operation of the system of interest. However, the traditional GAN loss is not directly aligned with the anomaly detection objective: it encourages the distribution of the generated samples to overlap with the real data and so the resulting discriminator has been found to be ineffective as an anomaly detector. Appearance features have been widely used in video anomaly detection even though they contain complex entangled factors. In this paper, we propose an unsupervised approach for traffic accident detection in first-person videos. With the increasing importance of online communities, discussion forums, and customer reviews, Internet "trolls" have proliferated thereby making it difficult for information seekers to find relevant and correct information. WaveletFCNN outperforms the state-of-the-art FCNN for the univariate time series classification on the UCR time series archive benchmarks. Finally, we demonstrate that a simple set of rules can be used to utilize the output of BINet for anomaly classification. 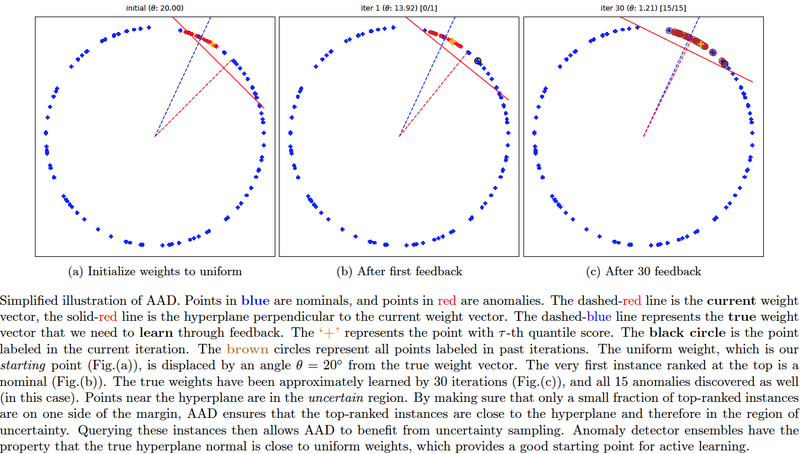 In this paper, we study the problem of active learning to automatically tune ensemble of anomaly detectors to maximize the number of true anomalies discovered. The prevalence of networked sensors and actuators in many real-world systems such as smart buildings, factories, power plants, and data centers generate substantial amounts of multivariate time series data for these systems. We introduce synthetic oversampling in anomaly detection for multi-feature sequence datasets based on autoencoders and generative adversarial networks.